As a Pennsylvanian native, I am constantly drawn into the environmental debates of my homestate. As someone who teaches at a college, I have always felt the need to try to approach controversial issues objectively and fairly in spite of my own reactions (often emotional) to a subject. Fracking is one of those issues. ​Jimmy Guignard, in Pedaling the Sacrifice Zone: Teaching, Writing, & Living above the Marcellus Shale, takes on the issue of fracking in Pennsylvania. Guignard teaches at Mansfield University, which is located about three hours from where I live. (That's actually close by rural Pennsylvanian standards). Guignard starts off his book with an argument -- not really an overall argument about fracking, per se, but an argument with his wife about fracking. The reader comes to find out that the author's family lives in northcentral Pennsylvania, the heart of the state's fracking land. She wants to buy a house outside of town (so that their family will have more room); the author does not, fearing the issues with the big companies that have seemingly taken over their world in the last few years. Guignard explains, "Where Lilace [his wife] saw escape, I saw risk." ​What follows is an exploration of the issue of fracking in Pennsylvania. Guignard approaches the issue of fracking through a rhetorical lens. In other words, he examines the way that words and symbols are used to influence people's beliefs about fracking. He delicately tries to balance the rhetoric of the big companies while offering a sympathetic ear to the local community, a community in desperate need of money (he himself is working at a struggling college). Yet, I wouldn't really call this book an academic read. As the author himself says in his preface, " I was a redneck before I was an academic and don't much enjoy that impersonal academic voice. So imagine I'm telling you this story outside a fire, beer or bourbon (or both) in hand." No, I didn't read Guignard's book with a beer in my hand (I'm more of an iced tea drinker), but I did whip through his words at record speed and came up thirsty for more books that explore fracking with the same passion and intellect I found in his words. In her newest novel, Jennifer Haigh returns to the small Pennsylvanian town of Baker Towers, a world she first explored in her 2005 book by the same name. In Baker Towers, she explores coal mining, but in Heat & Light, she opens her book with a short history of oil. Then, she delivers a single line that stayed with me as I read the rest of the book: "More than most places, Pennsylvania is what lies beneath." As someone who was born and raised in Pennsylvania, I am well aware of how defined my world was by what was beneath me. I am also well aware of the state's problematic relationships with the environment and the blue collar/working class world. Haigh's newest novel takes us into the heat of this relationship with the story of how fracking invades and thus, changes the lives of those who live in Baker Towers, Pennsylvania. It's through this story that learn about Rich Devlin, who leases his mineral rights to finance his dreams of farming. We learn about his young daughter, whose mysterious illness may or may not be because of environmental issues that have been caused fracking. We learn about a lonely preacher, who falls in love with one of the workers who is fracking the land. We learn about organic dairy farmers, Mack and Rena, whose business is hurt by the environmental issues going on around them. All of their lives are intertwined by the arrival of fracking in their world. Yes, Haigh's novel is political. There's no denying that. Still, she doesn't offer any clear cut answers to the questions she poses through her characters about a world where fracking may be both a blessing and a curse. Perhaps that is what I loved most about this book. Visit Haigh's website to learn more about Heat & Light and her other novels. Long-time readers of my website/blog know that I'm a huge Tawni O'Dell fan. I always have been, ever since I first read Back Roads (an Oprah Book club pick). 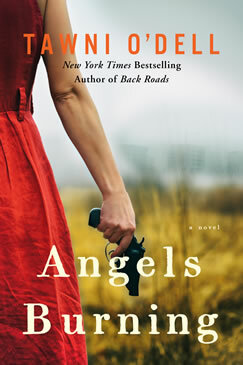 Coal Run, her second book, has been my absolute favorite, but I have to say that her newest book, Angels Burning may bypass her other books to move towards the top of my favorites list. Angels Burning opens with a murder. A teenage girl's body is found in a sinkhole of an abandoned coal town (eerily similar to the real-life Centralia, a town infamous for its underground mine fire). Chief Dove Carnahan, who hides family secrets of her own, takes on the investigation. What follows is more than just a murder mystery. Yes, much of the plot revolves around Dove seeking to find who committed the murder. Readers of mysteries, however, may be a bit disappointed as the plot and subplots veer off into many different directions so that the book is more than just a whodunnit story. Instead, readers will be treated with an exploration of character development and physical setting. Some readers may think that O'Dell approaches her characters with only stereotypes in mind, but I found that she navigates the back roads and people of Pennsylvania with a refreshing eye, pointing out the grit, stubbornness, and yes, sometimes violence that harbors in the northern Appalachia landscape. For more information about this book and her other works, visit Tawni O'Dell's website. If I had to sum up my feelings about Nancy McCabe's From Little House to Little Women: Revisiting a Literary Childhood in one sentence, it would be this: after reading this book, I now want to go back and re-read all my childhood favorite books. Part travel book, part memoir, part literary analysis, McCabe's book examines her love of reading while revisiting specific childhood favorites. Since McCabe herself grew up in Kansas, she feels a close attachment to the Little House on the Prairie series, and much of this book examines this series, while cataloging McCabe's own trip (with her daughter) to various homes/tourist attractions from the Little House books. She intertwines bits and pieces of her own history with reading, including her initial reactions to the Little House characters as well as her disdain to the television show. She also offers analysis of the books including reviewing the argument that it was Laura's daughter, Rose, who actually penned most of the books in the series. 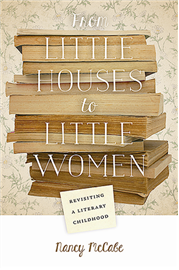 The Little House series clearly takes center stage in this book, but McCabe also examines Anne of Green Gables and Little Women. Throughout her book, she also looks at other childhood favorites including two of mine: The Trumpet of the Swan by E.B. White (I loved this book as a child, and sadly many people have never heard of it -- even those who have read White's classic, Charlotte's Web) and Down a Dark Hall by Lois Duncan (of I Know What You Did Last Summer fame). Her observations of the texts include her initial childhood readings along with more adult observations of the characters, plots, and time periods of publications. McCabe currently resides in Bradford, Pennsylvania (a mere 45 minute drive from where I live), so it was great to find a read from a local reader. Her website can be found here. 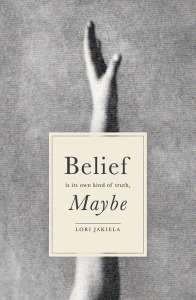 Lori Jakiela's Belief Is Its Own Kind of Truth, Maybe may be acclaimed as a work that explores adoption, but a closer look reveals that Jakiela's book is much more. In her newest book, Jakiela intertwines her story of looking for her birth mother with explorations of her relationship with the mother who raised her and her own personal struggles with motherhood. Jakiela starts off her book with a simple statement that sets the tone for her story: "When my real mother dies, I go looking for another one. The Catholic Charities counselor's word for this other mother I want after decades to find is biological. Illegitimate is another word for people who end up like me. It's what I feel now, unlawful, unauthorized, unwarranted her in this office that smells like antiseptic and rubber gloves, hot teeth drilled down to the bone." From this first paragraph, we are introduced to several important components of the book. Jakiela is not just feeling the loss of her mother, she is feeling a loss of herself, and she believes that looking for her biological mother is a step in regaining part of her personal identity that seems muddled and foggy (at least in her viewpoint). This is not what she tells the counselor, however. Instead, she says that she is looking for a medical history. What follows is a braided story. First, Jakiela chronicles her journey towards finding her biological mother. Second, she retells stories that highlight her relationship with the couple who adopted her. Finally, she relays her own frustrations (and joys) of being a working wife and mother. Readers who are new to Jakiela's work may find the nonlinear progression of her journey a little confusing, yet, I believe that many people who find this book are already familiar with many of the characters introduced in Jakiela's two previous memoirs, Miss New York Has Everything and The Bridge To Take When Things Get Serious. My advice to those who are new to the writing of Lori Jakiela: read Belief Is Its Own Kind of Truth, Maybe and then read her two other memoirs. I will bet you will return to Jakiela's newest memoir with a deep appreciation of the delicate way that she balances humor with her depictions of love, in its rawest, yet purest forms. For more information about this book, see Atticus Books. 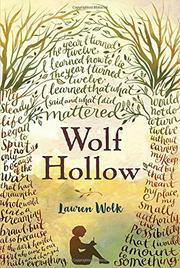 Lori Jakiela also keeps a blog where she explores many of the same themes found in her memoirs. Dean Bakopoulos's debut novel, Please Don't Come Back From the Moon, starts off on a surreal note. 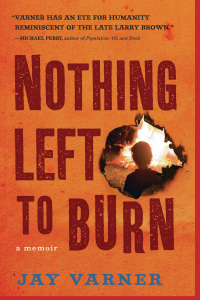 In the opening chapter, the author describes a Blue-collar neighborhood in Detroit where the fathers of the community start disappearing, many using the phrase "I've gone to the moon" to make their escape. After this first chapter, however, this novel drifts away from the surrealism and moves into the gritty world of the unemployed Rust Belt where mothers are forced to take on the roles of the vanished fathers and young men are forced to contemplate their own roles in a world that is no longer defined by the traditional ideas of work and family. As an avid reader of Rust Belt literature (if that really is a subgenre of literature), I know it's hard for a writer to tackle the subject of Blue Collar life in an unique way; yet I found Bakopoulos's novel an interesting coming-of-age story about the working class world in America. In this book, the reader meets Michael and his friends, all who are trying to learn how to navigate their fatherless world. The book starts with an almost nostalgic tone concerning the missing fathers as explained by Michael himself: "What I missed most was the collective drone of our fathers' lives, their big and clumsy presence. I even missed their cussing and their labored breathing from too many cigarettes." Soon, however, the missing fathers become mere ghosts, as the boys finish high school, find jobs, get married, and have children of their own. Throughout their lives, they fight to stay away from their own fathers' legacy of disappearance and abandonment. Please Don't Come Back From the Moon is one of those books (published quite a few years ago) that I somehow missed, so I'm glad I found it now. More information about this novel (and Bakopoulos's new book) can be found on the author's website.